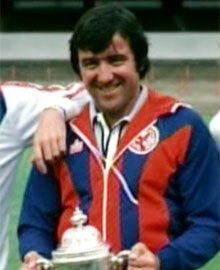 Season 1980/81 saw Crystal Palace use four managers, two chairmen and finish bottom of the First Division. Manager Terry Venables had sold Kenny Sansom to Arsenal over the summer with teenage striker Clive Allen and keeper Paul Barron coming the other way. Palace started their season in disappointing fashion, losing 3-0 at Liverpool on the first day. A thrilling 4-3 defeat at home to Tottenham followed which saw Vince Hilaire sent off for pushing referee Alf Gray, before the Eagles picked up their first win of the season with a home win over Middlesbrough when Allen netted a hat-trick. The team then registered victory at Bolton in the League Cup but were defeated by Wolves in the league. Work had begun on demolishing the Whitehorse Lane end for the new Sainsbury's. Palace began the month well with a 2-1 League Cup home triumph against Bolton to go through 5-1 on aggregate. But defeats to Coventry (Allen scored that famous free-kick "goal" that hit the stanchion and was disallowed), then Ipswich, Everton and Aston Villa in the league meant Palace were stuck at the bottom of the table. After holding Tottenham to a draw in the League Cup, Palace lost the replay 3-1 at Selhurst Park. Palace's bad run continued with losses against West Brom and Sunderland and the seven straight league defeats was the worst sequence of results since 1925. But they picked up three points against Leicester and Southampton. However, defeat at Leeds followed before the Eagles won a point at Norwich to stay rooted at the league's basement. Manager Terry Venables resigned and moved to QPR after falling out with the board. Long-serving coach Ernie Walley took over as caretaker boss. A memorable 1-0 win at home to Manchester United on the 1st failed to inspire Palace as they were unable to win any other games in the month. A 2-2 draw against Liverpool was the only other creditable scoreline. Birmingham, Tottenham Stoke and Manchester City all won against the Palace. They finished the month second bottom. Malcolm Allison rejoined the club as manager after getting sacked from Manchester City. But while incoming chairman Ron Noades was exchanging contracts with current chief Ray Bloye to buy the club, Allison sold John Burridge, Terry Fenwick, Mike Flanagan to Venables at QPR. Allison got his first home win with victory over Norwich, but a draw with Arsenal and defeats to Forest, Southampton and fellow strugglers Brighton meant Palace ended the year rock bottom in the table. Palace would go on to pick up just one more victory over the rest of the season. Hopes of an FA Cup run were dashed when Manchester City ran out 4-0 winners. The month included two league draws - Stoke and Wolves - and a defeat at Middlesbrough. Terry Genoe arrived on loan from Southampton. Alison only lasted 55 days at the helm before leaving the club when Wimbledon chairman Noades completed his takeover. Noades replaced Bloye who had been chairman since 1972 and had amassed huge debts then appointed Dario Gradi as the new manager. Palace failed to win any of their fixtures this month as Ipswich, Coventry, Aston Villa and Everton won were all victorious to go six points adrift at the bottom of the table. Gerry Francis joined QPR and loanee Terry Genoe returned to Southampton. The losing sequence continued with defeats to West Brom and Sunderland, before Palace drew at Leciester but fell at home to Leeds. Palace were now 11 points adrift of safety and virtually relegated. Peter Nicholas left for Arsenal in a £500,000 deal with David Price coming to Palace at the same time for £80,000. QPR boss Venables sold Tommy Langley to Palace for £120,000 and Brian Bason joined from Plymouth for £80,000. Gary Goodchild moved to Norway and Tony Sealy rejoined Venables at QPR in an £80,000 switch. The Eagles got their first victory since December with a 3-1 success at home to Birmingham. The attendance was the worst since 1968. The loss against Man Utd saw Palace relegated with further defeats coming from Brighton (again), Arsenal and Forest which cut Palace even further away from everyone else at the bottom. Dave Swindlehurst made his loan move to Derby permanent after the Rams smashed their transfer record to capture the striker for £400,000. The last game of the season saw bottom club Palace draw 1-1 with Man City - in what would be their final top flight match for eight seasons. They won just six matches - all at home - and were 15 points behind fourth-from-bottom Wolves. Palace's points tally of 19 was a record low for a First Division season.